Camelot Motor Inn is located conveniently in the centre of Hamilton. Walking distance from the CBD, Rugby and Cricket Stadiums. Although we are on one of the main roads in Hamilton, careful design and use of noise reducing materials mean that our rooms are a peaceful oasis form the inner city. Hamilton itself is a wonderful hub from which day trips to many of New Zealand’s best known attractions can be made. By basing yourself at Camelot you are able to relax, unpack and enjoy excursions to Rotorua, The Bay of Plenty, Waitomo Glow Worm Caves, Blackwater Rafting and the famous surf beaches at Raglan. Having a base also allows you to take a little time out from your travelling and do those essential jobs such as laundry and ‘sorting out the packing’. If you would like to know more about our extend stay rates please call or email. We are a five minute taxi ride from both the main bus station, the city centre and the Skycity Casino and we can help you with the organization of transport if required. The following are events in Hamilton and upcoming events that may find of interest. Please visit these sites to find out more about Hamilton and events. 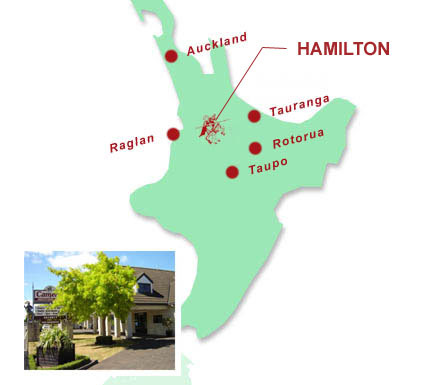 Hamilton Events - The events calendar for Hamilton, New Zealand. You will also find information on most events in the Waikato. Waitomo is just one hour south of Hamilton. Visit famous caves, have adventures with the Legendary Black Water Rafting team or the many other activities. Take time to see the wonders of the living world in a wildlife sanctuary renowned for its generous habitats and sympathetic approach to conservation.